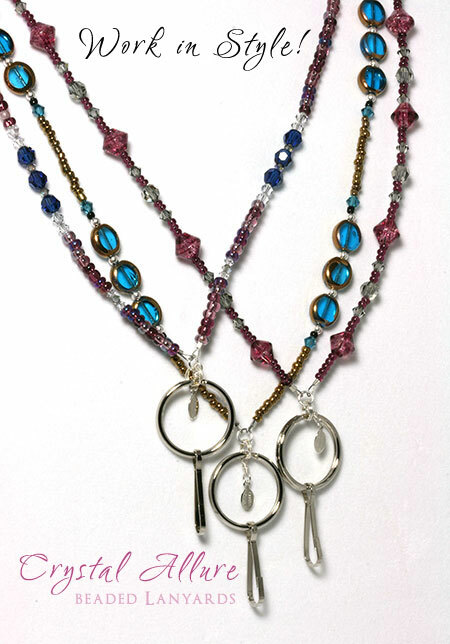 With the close of the last jewelry show of 2012, I spend a great deal of time updating the website with all the lovely new beaded jewelry that has been screaming to be posted. There's still more to be listed and that will come soon but....right now, I'm super excited to introduce the newest beaded gifts to grace the Crystal Allure Jewelry website. It still baffles me why it took so long to start creating beaded lanyards since it's been on the "bucket list", so to speak, for as long as I can remember. Well, a recent event finally pushed them to the front of the studio desk. I happen to work a full time job where I am suppose to wear a badge. Most companies, these days, require workers to wear badges. As a rule, I tend not to wear it everyday but I always have it with me, just in case. Of course, the other day I get called, last minute, to an important meeting with the CEO and CFO. I grab my stuff and head off....only to discover I forgot my badge! It was at the very moment I realized, DUH!, if I had a laynard, I'd be wearing my badge all day, all the time! That very night, I started creating and within days, I had ten new handmade beaded lanyards (I kept one for myself, of course) and a half dozen more are in the works. This was one of those 'slap your forehead' kind of moments because really, beaded ID badge holders are a necessity in today's business world. And, if you're anything like me, those pre-stamped cloth lanyards are boring. Since that day, I have not forgotten my badge once because I now wear it everyday, with my stylish new beaded lanyard! I love how my work outfit feels complete, stylish and versatile by simply adding one of these ID badge holders to the look. These are now my newest obsessions and so many more will be coming soon. I hope for now, you enjoy (and pick one up for yourself) the current selections that offer styles for everyday wear, Christmas, holidays, autumn and even spring. With the upcoming holidays, don't forget, these beautiful beaded lanyards make great gifts for coworkers, nurses, doctors, hospital staff, teachers, or anyone who has a need to wear a badge or carry important keys with them. View the full handmade Beaded Lanyard Collection. Great idea...like you I've been meaning to make these for years, just never took the time! Yours are lovely and I can see why it would make women more apt to wear their badge!